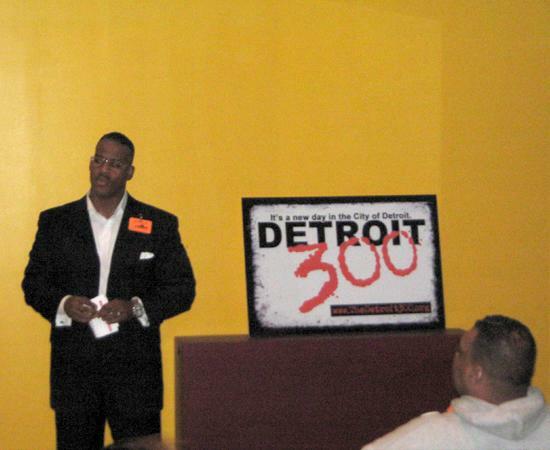 Detroit 300 is a volunteer community policing group that has worked closely with police to investigate some of the shootings. The group’s founder and leader, Raphael Johnson, himself spent years in prison for a murder he committed at age 17. Johnson says a gangster culture that glorifies violence and reviles “snitching” also plays a role. But he says the reasons are ultimately irrelevant when people are dying—and that justifies the Detroit 300’s use of what some call vigilante tactics. They swarm neighborhoods with loudspeakers, and even make citizen’s arrests when they deem it necessary. “The bottom line is that until someone finds the answer, I am not going to sit around, nor are the Detroit 300 going to sit around and be victimized,” Johnson says. Valerie Burris agrees that many Detroiters are desperate. “The needs are getting greater and the resources are getting scarcer. And so we see a lot of desperation,” says Burris, who helps run a Detroit block club and works with the group Women on Patrol. They go door-to-door in targeted neighborhoods and try to preempt violence by meeting people’s basic needs. Burris says a lack of jobs, unaddressed mental health issues, and drug and alcohol abuse create an explosive atmosphere where violence can erupt from petty arguments. Often, that leads to a cycle of retaliation that spirals out of control. And Burris says many people don’t trust the police to solve the problem. Detroit Mayor Dave Bing released a statement Saturday saying, “reducing violent crime” is his top priority…and “the community must work” with officials to stop the violence. But Burris thinks the Mayor needs to connect with Detroiters on a more emotional level. “I really would hope that the Mayor would come out and really speak to the people, not AT the people,” she says. Detroit Police are assessing their deployment strategies and testing other initiatives. But as official Detroit struggles to get a handle on the violence, community-based efforts are doing what they can—but even their leaders admit it’s not enough.